To demonstrate how growers and stakeholders can improve the production capacity of farms—while reducing overall environmental impact—Agrinos recently calculated the environmental benefits of its microbial and biostimulant products using the Cool Farm Tool and other independent analysis tools. 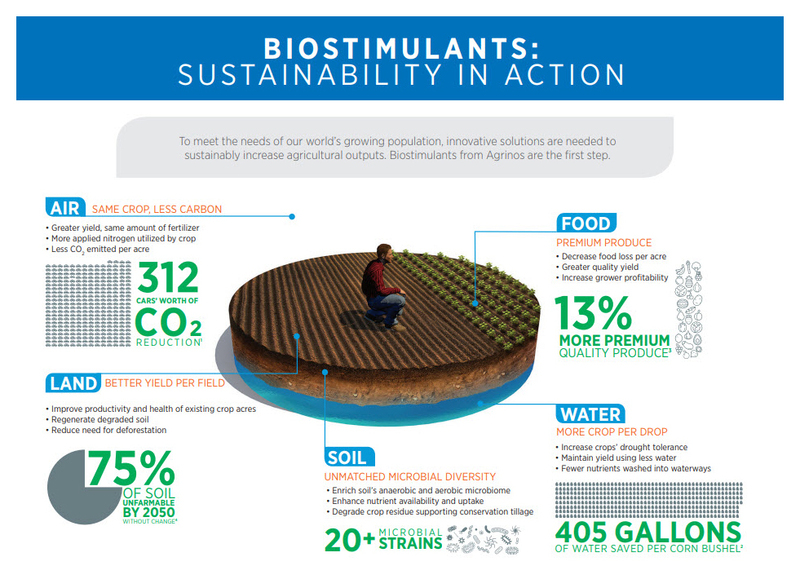 Click on the infographic below to see how Agrinos’ innovative crop inputs can help reduce CO2 emissions, increase water utilization, reduce fertilizer runoff, increase quality crop volume and rejuvenate soil health. Soil: Unmatched Microbial Diversity – The microbial diversity of Agrinos’ products is unmatched in the industry. With more microbial strains that deliver key benefits to the soil microbiome and improve soil health, Agrinos’ crop inputs can enhance nutrient availability and uptake and help degrade crop residue, supporting conservation tillage practices. Air: Same Crop, Less Carbon – Agrinos’ products can enable crops to utilize more of the nitrogen that’s been applied, delivering greater yields from the same amount of fertilizer. This results in less CO2 emitted per acre. Measurement: Equivalent to reducing 312 cars worth of carbon dioxide from the atmosphere. Water: More Crop Per Drop – By improving the crop’s ability to utilize water, Agrinos’ products can increase crops’ drought tolerance, maintain yields using less water and result in fewer nutrients washed into waterways. Measurement: 405 gallons of water saved per bushel of corn. Food: Premium Produce – By promoting healthier and more productive crops, the use of Agrinos’ products can result in an increased volume of premium produce and more quality yield. This means decreased food loss per acre and increased grower profitability. Measurement: 13% increase in premium quality produce per harvest. Land: Better Yield Per Field – Agrinos’ microbials and biostimulants can improve the productivity and health of existing crop acres, regenerate degraded soils and reduce the need for deforestation. Measurement: 75% of agricultural soil will be degraded by 2050 without a change in practices. Agrinos is a member of The Sustainability Consortium, Cool Farm Alliance, Biostimulant Coalition, European Instruments Industry Council and Biological Products Industry Alliance.